The influence of low doses of beta radiation on the changes in the structure and selected properties (mechanical and thermal) polymers were proved. 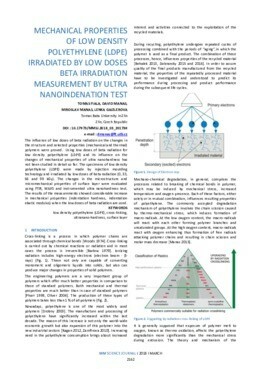 Using low doses of beta radiation for low density polyethylene (LDPE) and its influence on the changes of mechanical properties of ultra nanohardness has not been studied in detail so far. The specimens of low density polyethylene (LDPE) were made by injection moulding technology and irradiated by low doses of beta radiation (0, 33, 66 and 99 kGy). The changes in the microstructure and micromechanical properties of surface layer were evaluated using FTIR, WAXS and instrumented ultra nanohardness test. The results of the measurements showed considerable increase in mechanical properties (indentation hardness, indentation elastic modulus) when the low doses of beta radiation are used.